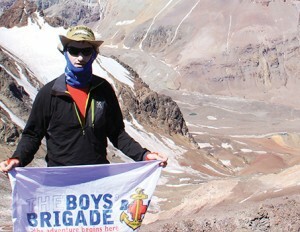 23-year old Cameron Gray, from 1st Cumbernauld Company, is undertaking a significant challenge - to climb 7 summits in 7 continents - to raise money and awareness for The Boys’ Brigade in Scotland. The trainee accountant came up with the plan to climb the highest mountain on each of the earth’s seven continents. In addition, Cameron is also organising a World Record Attempt at setting a new world record for the longest ever continuous, 5-a-side football match, which currently stands at 56 hours. Q: How did this ambitious challenge come about? A: Both mountaineering and the BB have been, and continue to be, huge influences in my life, so why not combine the two? It’s really important to me that our young people are given the opportunities that I was fortunate enough to be given, and I hope this will help raise awareness of what we do. Q: How does the football world record attempt link in with your ambition to tackle the seven peaks? A: It’s about personal achievement, but making this achievable to more people than just me. When BB young people are world record breakers, they’ll be able to look back at that with a great sense of achievement and satisfaction. Q: What kind of training have you done? A: Spending time in the mountains! You can spend hours on a treadmill, but nothing can prepare you better than hiking with a rucksack on your back and getting used to spending several hours on the go! Q: You completed stage one of the challenge having climbed Kilimanjaro and returned from Argentina, in January, after attempting to climb the 6,962 metre giant of Mount Aconcagua, the highest mountain in the world outside of the Himalayas. Things didn’t go quite to plan – what happened? Q: What is the response of BB young people to your ambitions? A: Overwhelming interest and support… They’re enthusiastic about it and I definitely think it will help inspire BB youngsters to set challenges and goals. For instance, I think BB young people might be encouraged to take on The Duke of Edinburgh’s Award. A few in my own Company have enquired why I couldn’t reach the summit! Cameron is due to travel to Russia to take on his next challenge – Mount Elbrus, a dormant volcano located in the western Caucasus mountain range, which stands at 5,642 metres - in July. We asked Cameron about his motivation to keep going despite being faced with several challenges on his attempt to climb Mount Aconcagua. You can hear this final part of his interview at here.